This deviled egg recipe is for the adventurous eater. 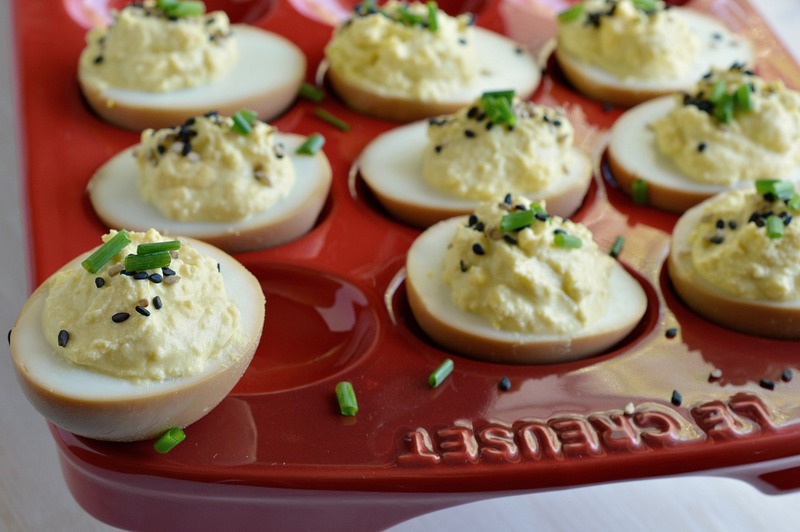 Deviled Soy Sauce Eggs are first cooked in a soy sauce mixture then prepared into deviled eggs. Top with sesame seeds and chives. 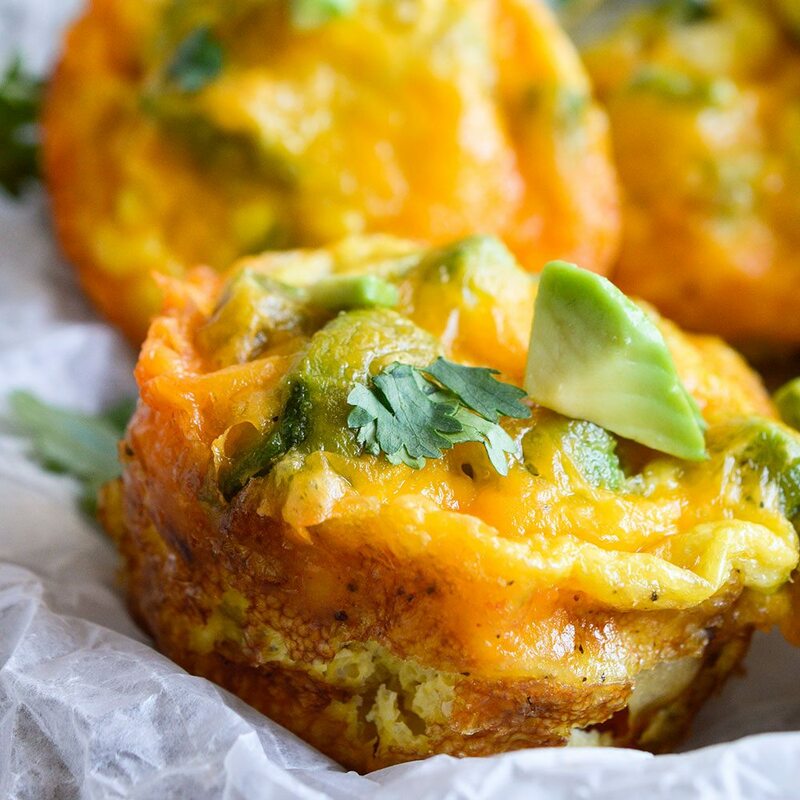 These eggs are full of Asian flair and unique flavor! 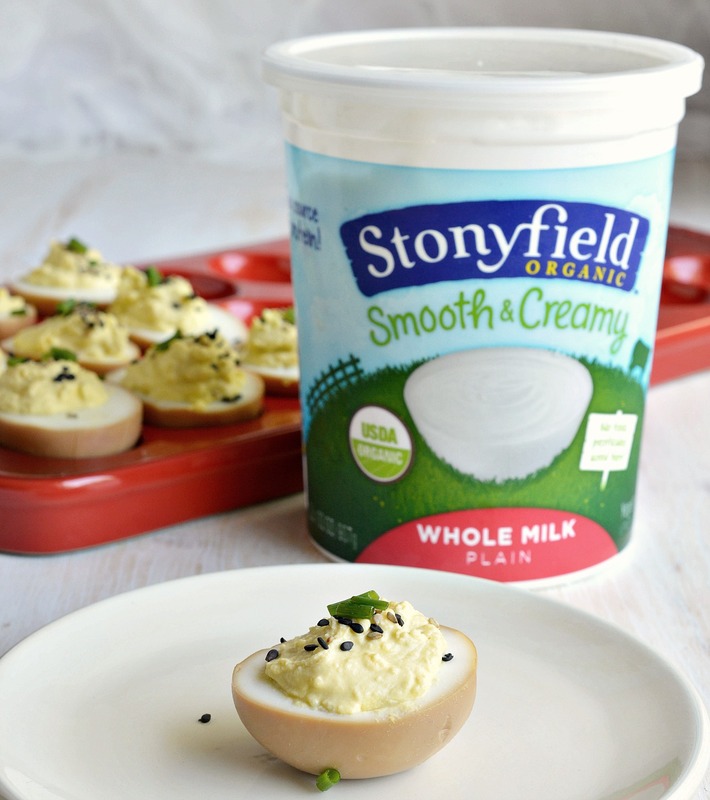 I am proud to be partnering with Stonyfield, Le Creuset and Kitchen IQ to bring you this tasty recipe! As always, all opinions are 100% mine. 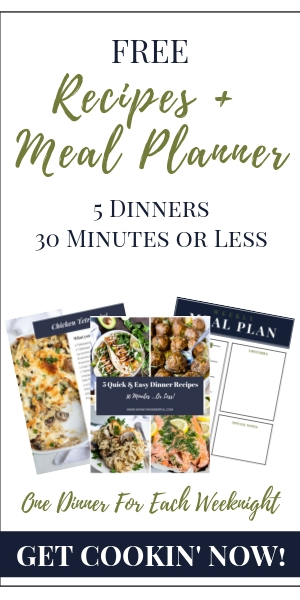 By now you all know that I love to take classic family recipes and give them a unique twist. It’s kinda my thing. Plus, I just get a little bored eating the same thing prepared the same way over and over and over. Like deviled eggs. Sure they are delicious and always a part of my family’s holiday feasts. But, sometimes it is nice to dress ’em up and make them interesting. A while back I happened to notice an Instagram post from Belly Full. Amy posted a photo of her soy sauce eggs. I was intrigued and made some that day! They were terrific! Salty, briny hard-boiled eggs make the perfect snack. I decided to take it a bit further and make Deviled Soy Sauce Eggs. 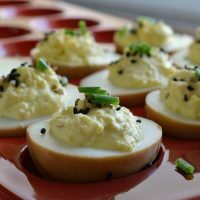 Not only is this a truly unique deviled egg recipe but these eggs are also a gorgeous addition to any feast! First you boil the eggs as you would normally. 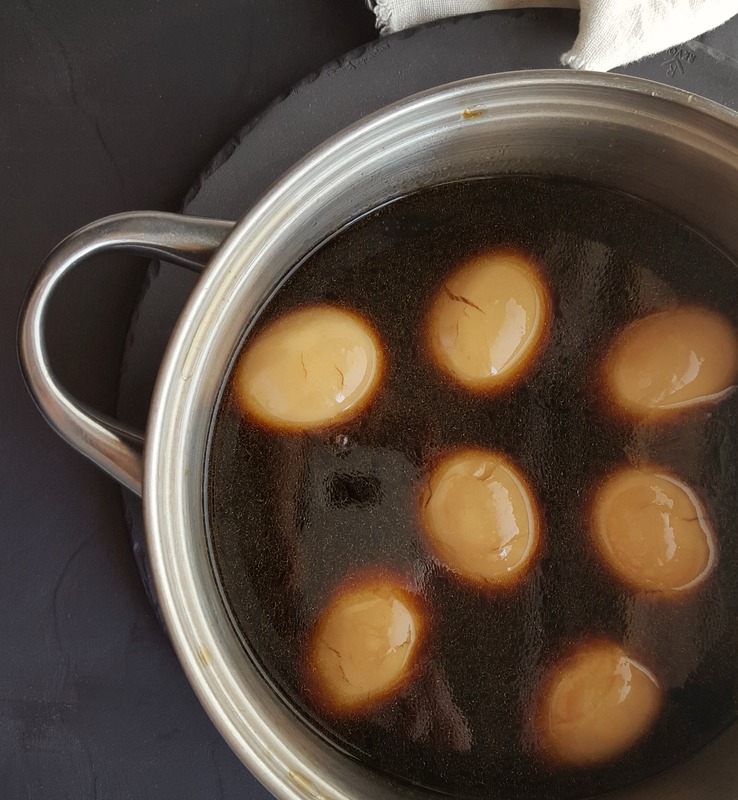 Instead of marinating the boiled eggs in soy sauce overnight I simmered them just long enough to infuse the color and flavor into the egg white. Then just make the deviled eggs as usual. I use Stonyfield Organic Smooth & Creamy Whole Milk Plain Yogurt. 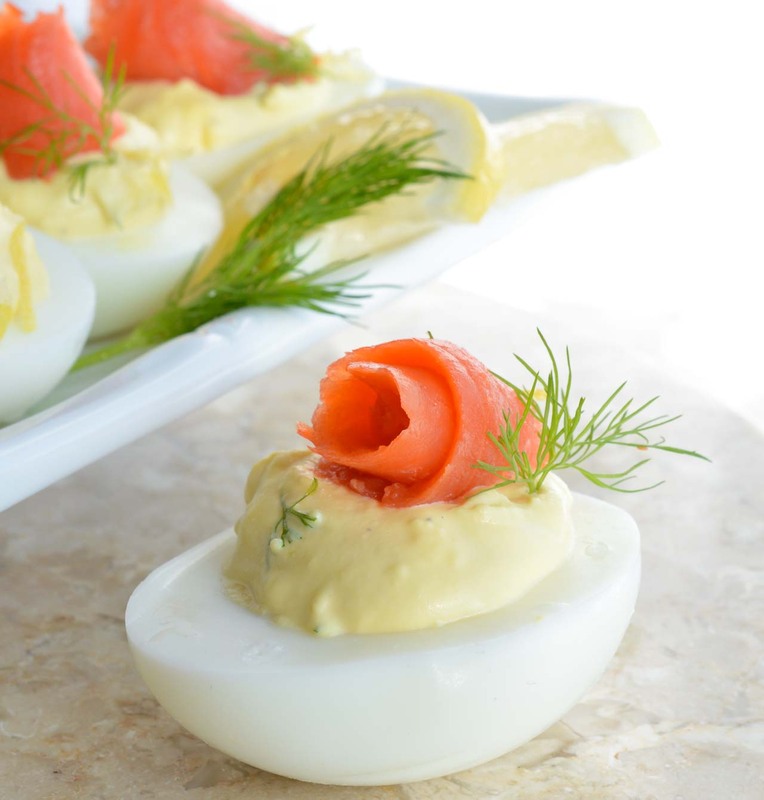 I find that regular yogurt and Greek yogurt work just fine in deviled egg recipes. 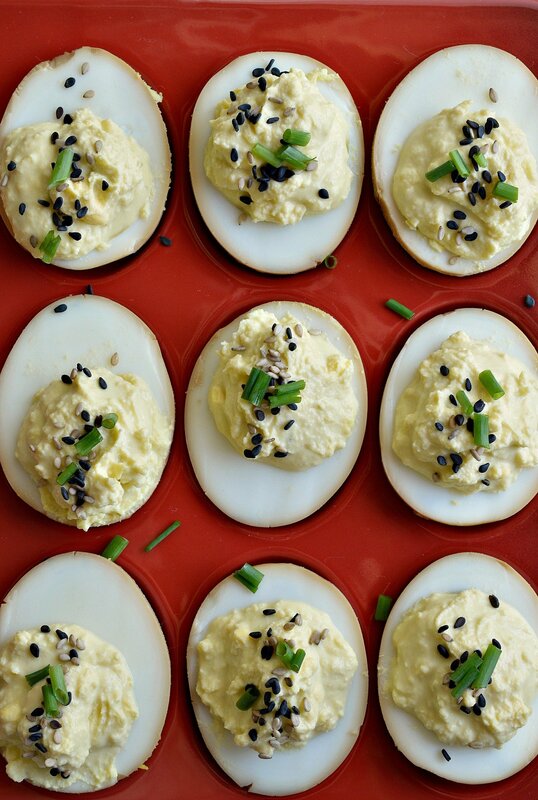 And ditching the mayo makes these Deviled Soy Sauce Eggs healthier. 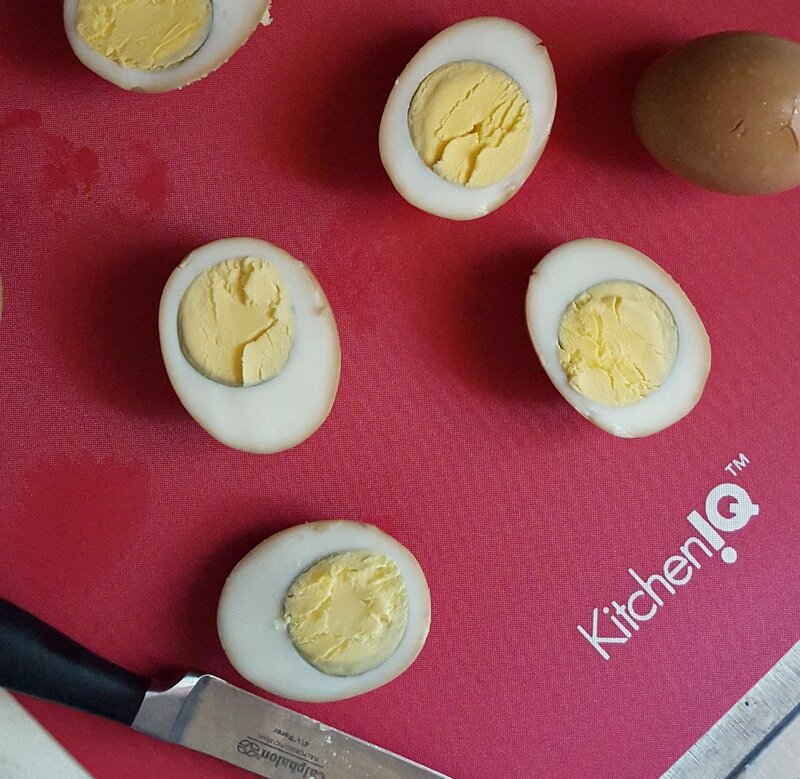 I used my new Kitchen IQ flexible cutting board for prepping. Then I served the eggs in a gorgeous Le Creuset deviled egg tray. Who’s ready for the holiday feasts!?!?! You may want to double this recipe for family gatherings because a person can easily eat 4 or 5 eggs . . . Just Me? Top with sesame seeds and chives for a nice presentation. There you have it, a family favorite comfort food with a little Asian flair! Peel eggs and transfer to small pot. Mix soy sauce, water, sugar and sesame oil. Pour over eggs. Once boiling, decrease heat and simmer for 5 minutes. Remove from heat and allow to sit in soy sauce mixture for 10-15 minutes. Remove eggs from soy sauce and refrigerate until cold. 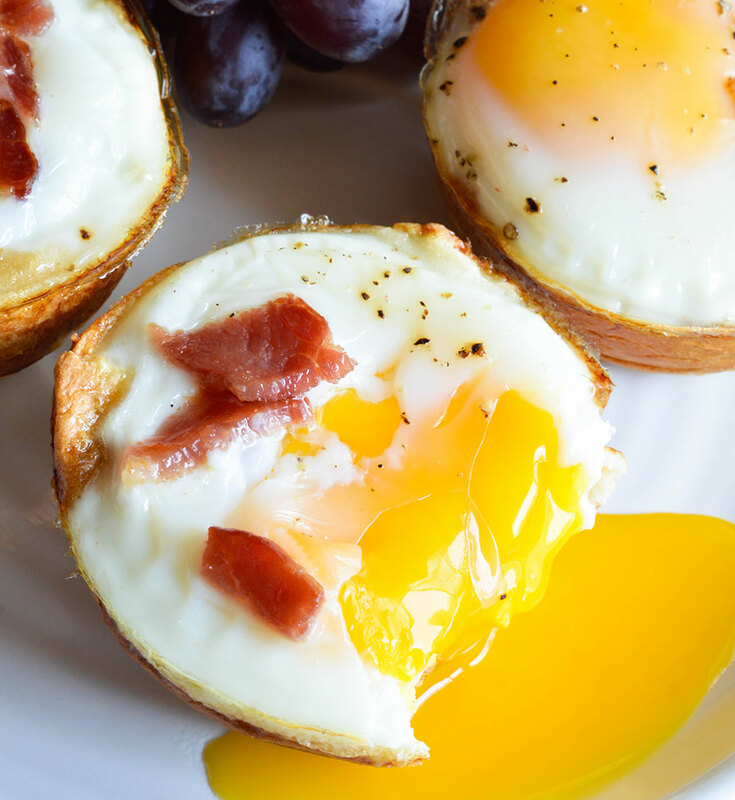 Slice eggs in half (lengthwise), transfer yolks to small bowl and set egg whites aside. Combine yolks, yogurt and salt. Stir with fork until smooth. Spoon mixture into egg whites. Top with sesame seeds and chives before serving. More Egg-celent Recipes . 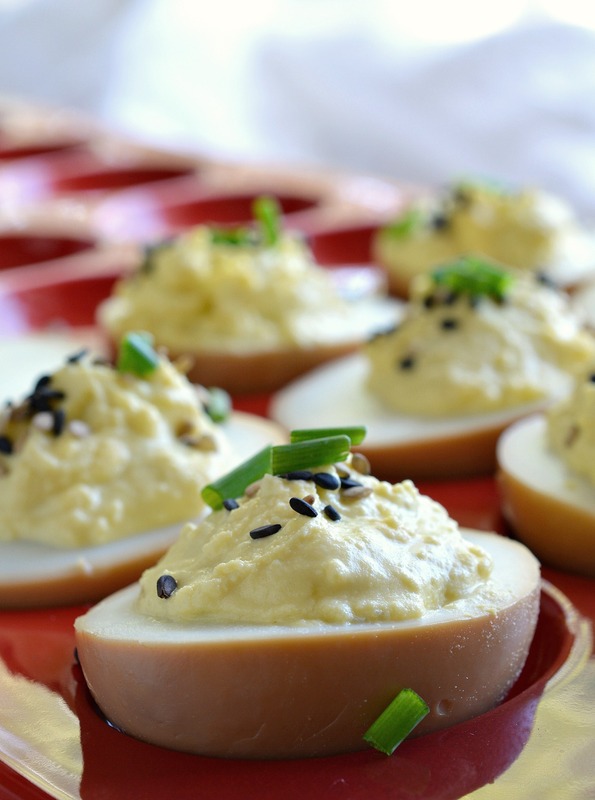 . .
Love the twist on the traditional deviled eggs!